Thanksgiving was great and it was nice to see my family and friends in my home state of California. My Strudel Apple Pie was a hit though there were many great desserts to choose from. However, this year there wasn’t one homemade pumpkin pie! I was counting on a homemade pumpkin pie. Sigh. . . I did see the ex-large pumpkin pie from the famous “big box store,” but not one slice was taken from it. I was sure that there would be at least one at our family Thanksgiving dinner. However! 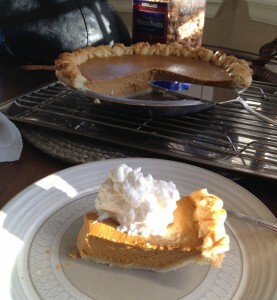 I did have a great semi-homemade pumpkin pie at my in-laws house and it was almost the exact recipe as mine. So to assure my holiday season starts out right, and to end my craving, I made a pumpkin pie with homemade crust and whipped cream. The secret to my mom’s pumpkin pie? Libby’s Famous Pumpkin Pie recipe, plus a little added spice and a bit of vanilla makes the best pumpkin pie. It’s that easy. 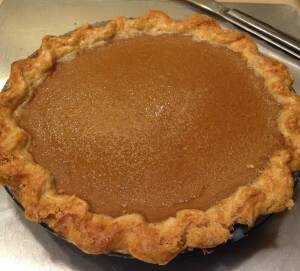 I’ve had many samplings of pumpkin pie over the years and many lack enough seasoning, or the mix is over seasoned with cinnamon or the batter is simply not seasoned at all! Yuk! No wonder there are a few people who just do not like pumpkin pie . Probably because they haven’t had a good seasoned pie. I cook my pumpkin puree in a sauce pan on medium flame just enough to heat it through to remove the “tinny” taste of the can. I recently learned this trick from Cook’s Country Kitchen. That’s if you are using a canned puree. Prepared pumpkin puree is probably one of the few canned foods that are truly good straight from the can. Otherwise, making your own pumpkin puree is great. I’ve done it and the pie has a lighter pumpkin flavor, but that’s another post! It’s not hard, just more time. The other component of making a good pie verses a great pie, is the crust. I love my recently discovered Vodka Pie Crust from Cooks Country Kitchen. Give it a try if you’re not opposed to making your own crust. The crust is very airy and flaky. It melts in your mouth. I find most people really like it and ask for the recipe. You just need a fourth cup of vodka for this double crust recipe. I’ve used a vanilla flavored vodka and it turns out well, too. You really don’t taste the vanilla flavoring, but I wouldn’t use any other flavored vodka’s. This famous go- to recipe hasn’t changed in over 40 years, or more. It’s so easy and you can make it to your liking very easily by adding your desired amount of seasonings. I’ve experimented and added fresh orange juice and bits of orange rind, too. But try this recipe first, then make it your own if you want. 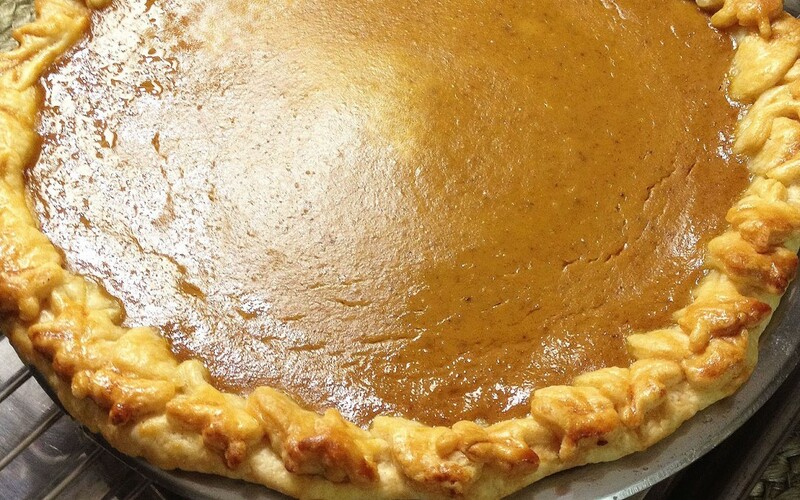 Remember, pumpkin pie isn’t just for Thanksgiving. Our family makes it for Christmas and New Year’s, too! It’s one of my favorites and among the lowest in calories per slice! Enjoy! The best pumpkin pie recipe that has been make famous by Libby's baking team. I've added a couple of ingredients for added flavor along with homemade pie dough and whipped cream. A Thanksgiving favorite to kick-off the holiday season. Step 1 Preheat oven to 425 degrees. Step 2 Prepare the pie dough and crimp decorative edges. In a small bowl mix the egg and milk/water to make egg wash. Brush egg wash over the crust and place in the freezer. Step 3 In a medium sauce pan, heat the pumpkin puree on medium heat until just warm, stirring to prevent overheating and burning. (This process removes the tin taste out of the puree). Step 4 Place the warm pumpkin puree in a large mixing bowl. Add the sugar and mix thoroughly. Then add the eggs to the pumpkin mixture to combine. Step 5 Add the spices and vanilla to the mixture. Step 6 Slowly whisk the condensed milk to the seasoned pumpkin mixture to combine thoroughly. Set aside. Step 7 Remove the prepared pie dough shell from the freezer. Place the pie dough on the middle rack of the preheated oven. 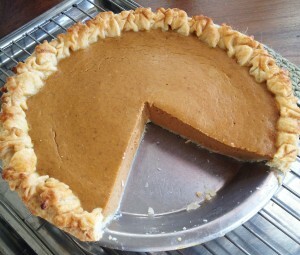 Pour the pumpkin mixture into the pie shell, filling to just below the decorative edges. 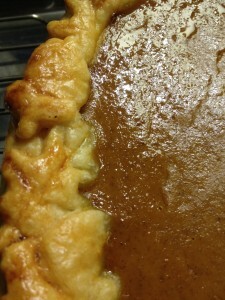 Carefully slide the oven rack back into place trying not to "slosh" the pumpkin mixture on the crust edges. Step 8 Bake at 425 for 15 minutes. Then reduce the oven temperature to 350 degrees and bake for another 40-50 minutes, or until the internal temperature of the pie reaches 175 degrees or when a toothpick is inserted in the middle of the pie and comes out clean. Step 9 Allow pie to cool until room temperature. Serve with whipped cream.